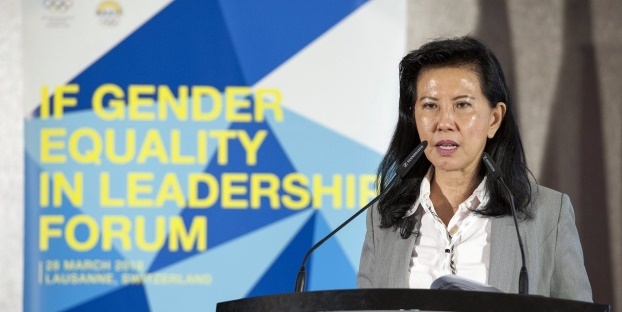 Photo: WBSC Secretary General Beng Choo Low speaks at the IOC-ASOIF 3rd IF Gender Equality in Leadership Forum in Lausanne, Switzerland, on 29 March 2018. LAUSANNE, Switzerland -- 10 April 2018 -- Baseball/softball ranked second overall with four women, including WBSC Secretary General Beng Choo Low, on Forbes' inaugural list of the 25 Most Powerful Women in International Sports 2018. A total of nine sports were represented on the list, with football leading with eight women, followed by baseball/softball's four. Forbes, one of the world's leading business news companies, considered four metrics -- money, media presence, spheres of influence and social impact -- to compile its new list, which included women from 19 countries. WBSC Secretary General Low (Malaysia) ranked 17th, while FIFA Secretary General Fatma Samba Diouf Samoura (Senegal) topped the list. The Japan's Women's Baseball League ranked 16th; Blanca Uribe, the Toros de Tijuana Deputy Executive President and Liga Mexicana de Beisbol (LMB) 2017 Executive of the Year, ranked 18th; and Taiwan's first female baseball umpire and WBSC World Cup umpire, Po Chun Liu, ranked 19th. Separately, Kim Ng, Major League Baseball (MLB) Senior Vice President for Baseball Operations, ranked 10th on Forbes' 2018 list of the Most Powerful Women in U.S. Sports. "This recognition by Forbes further reaffirms that women are helping to shape sport and the baseball/softball industry across the world," said WBSC Secretary General Low. "While baseball/softball is among the highest grossing sports in sports and entertainment, with approximately US$ 15 billion in annual turnover, our worldwide movement also provides an accessible platform for young people -- and especially girls -- to play and stay in sport, and become leaders in sport," said Low. "The fact that baseball/softball has the second-most representatives of any sport on the Forbes list is a strong reflection of this." The WBSC Secretary General also said that women in baseball/softball being among Forbes' recognised leaders in world sport demonstrates that baseball/softball embraces and supports the Olympic ideals of gender equality. "We are ready for our spectacular Olympic comeback at Tokyo 2020, where our sport is set to show the value that we can add to the Olympic Movement," said Low, "and WBSC is determined to secure a permanent place for baseball/softball on the Olympic Programme." Elected WBSC Secretary General in May 2014, Low was instrumental in securing baseball/softball's return to the Olympic Programme for Tokyo 2020, and was a key figure in the merger of the international baseball and softball federations, which launched the new world governing body, WBSC. Commenting on the WBSC-International Working Group on Women and Sport (IWG) partnership last October, IWG Co-Chairperson Maphorisa said: "A growing global sport like baseball and softball, particularly with its youth and commercial appeal, can play a significant role in helping to shape a more female-inclusive sporting world." Low, who has represented Malaysia in softball, is also a member of the Olympic Council of Asia Sports Committee and was the Olympic Council of Malaysia's first female Secretary General. To view the complete list of Forbes' Most Powerful Women in International Sports 2018, visit https://www.forbes.com/sites/alanaglass/2018/03/27/most-powerful-women-international-sports/#6e03c8df7585.